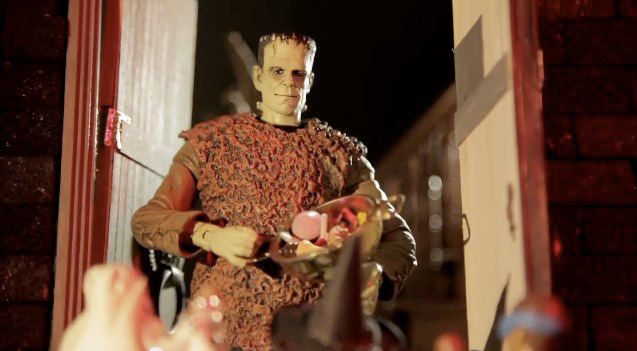 Starring some of the toy line's most famous characters, "Trick or Treat" was animated by Alex Kropinak, the animator behind Marvel.com's "What The...?!" Using a combination of stop-motion photography and computer graphics, Kropinak brought to life the actual action figures, sculpted by Gabriel Marquez, Rudy Garcia and Jean St. Jean. The film's cast includes the Mummy, the Wolfman, Dr. Jekyll, Mr. Hyde, the Creature from the Black Lagoon, Frankenstein's Monster, the Bride of Frankenstein, Dracula and the Metaluna Mutant. Kropinak even included a cameo appearance by Diamond Select's first-ever original concept action figure, Van Helsing. Designed by DST President Chuck Terceira and sculptor Jean St. Jean, the famous monster hunter received his own 7-inch scale figure this year, which was released at the same time as the newest Universal Monsters assortment. 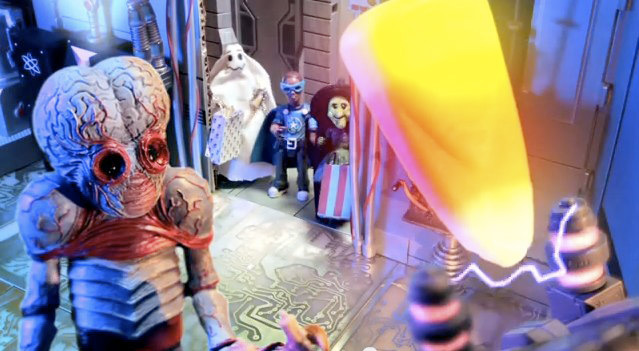 The film was co-written by Kropinak and DST Marketing Supervisor Zach Oat, who previously collaborated on ToyFare magazine's Twisted ToyFare Theatre. The newest series of Universal Monsters (and Van Helsing) are available, or available to order, from your local comic shop. Find your nearest comic shop at http://bit.ly/findcomicshop!